Last month’s nugget of wisdom encouraged you to Think outside the box and be creative with your job search. To help you do just that, I’d like to share a nugget of wisdom from a man who has lavished me at company Christmas parties and work dinners with his fascinating stories (like the time he was dodging bullets in revolutionary Iran). 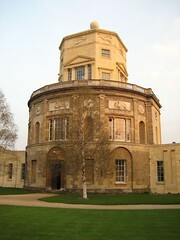 Sir John Hanson was Director General of the British Council for several years and then Warden of Green College at Oxford University (where his portrait hangs at the Radcliffe Observatory). I admire him greatly, and he provided me with many a nugget of wisdom. Look at sectors that are going to be buoyant and position yourself accordingly. There’s not much more I can add to that. This advice comes from someone with a lot of experience and who clearly knows what he is talking about. Now, go back and re-read last month’s post (or read it for the first time, I am not offended that you haven’t read it yet). Then go and think outside your usual box. Bottom line: Position yourself in buoyant sectors.